Installing a solar panel is a piece a cake...at least that's what it said in the installation manual. And it would be true, if I weren't installing it on a boat! 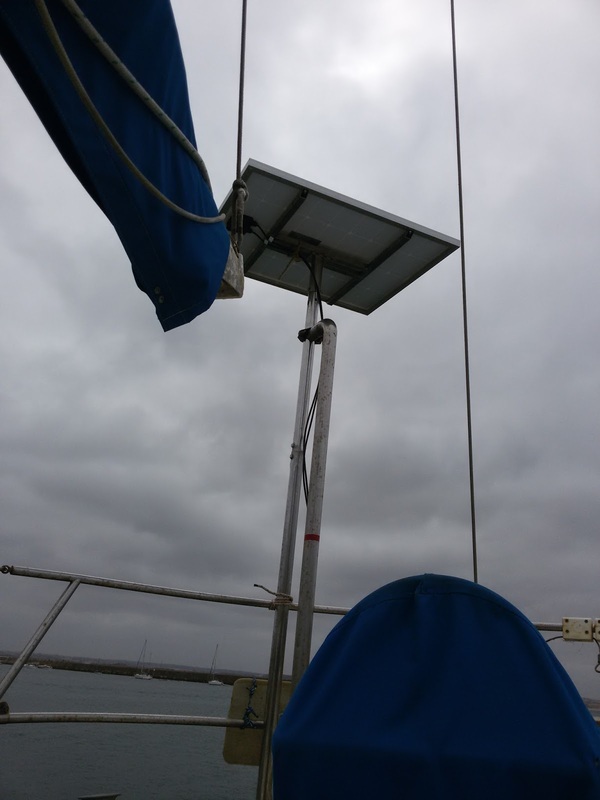 It took only about one hour to install the 80 W Bosch solar panel on its pole mount. That part was easy. I basically used the old wind generator pole with a modified mounting frame made at a local metalworking shop. Not the best summer day, but good for testing the solar panel output. Then came the wiring. The solar cables are thicker than the ones I used for the wind generator, so I had to find another hole to feed them into the boat. After much head scratching, I finally removed an old tiller pilot power socket (previously used for my ruined windvane) and fed the wires through that. Attaching the charge controller to the bulkhead in the dungeon was also easy - 4 small screws and that's it. Next, you'd think that it would be a simple job of using the old wind generator wires to the battery. But for one reason or another, nothing is easy on on a boat. Although the wind generator wires ran right over the house battery, I needed an extra 1.5 meters to lead them down to the battery terminals. 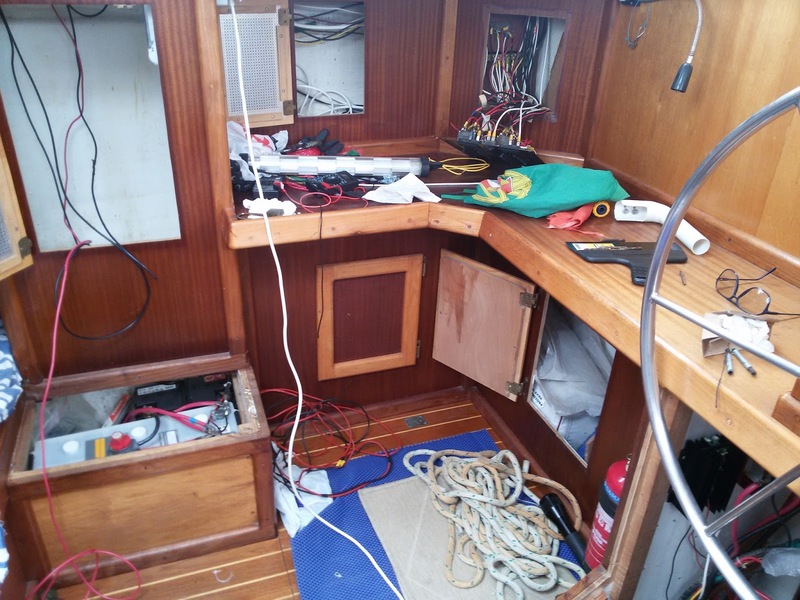 The problem was that they snaked through mysterious places - bunched up with lots of other wires - all the way to the engine room where they were hooked up to the wind generator controller and then to the alternator splitting system. Tracing those two wires and pulling them out from the spaghetti mess in impossible to reach places was a good yoga workout. The old wind generator wires ran all the way to the engine room seen on the far right. I needed to pull them out in order to run a direct route to the house batteries shown on the bottom left. After copious cursing, sweating and ranting to myself, I sort of got it done...for now. I finally got the wires hooked up and, even on a cloudy day, it didn't take long for the 180-amp house battery to hit 14.7 volts. Yes sir, it was worth the money and sweat. It felt good reading the voltmeter, real good I tell you. PS. If I were smart (IF!!! ), I would have used the old wires to charge the engine battery and installed new wires to the house battery. Now I have to run a new set of wires to the engine battery along the same path as the wires I removed. Did I ever feel stupid when I realized this. But then again, if I were smart, I'd be living the life I dream about. That's enough for today. In my next post you'll be hearing about the biggest F#$%&! screw-up the F%&/#$ marine shop made that's making my balls hiss. Incompetent pukes!!!!! Almost as stupid as me. The good news is that July 26 remains the planned date of departure to the Algarve.